I would be lying if I said coming up with a variety of healthy, real food, peanut-free, tree nut-free, portable lunch options wasn’t a challenge. I understand that the school is trying to protect children with severe peanut/tree nut allergies, but I have to admit that I often feel their little rules conflict with what we are trying to do…eat real food that is. On the school’s “safe snack list” which offers hundreds of “approved” options I literally found only 15 items that we would also consider to be “approved” for our kindergartner. They seriously have “Wendy’s Frosties” listed as an approved option so I suppose they would rather me send in one of those or something like a package of goldfish for her snack instead of a little all-natural cashew/dried fruit mix? I know I can’t just sit here and complain and not do attempt to do anything about it. I am definitely going to do something…not necessarily overrule the nut-free aspect of it all, but something to hopefully encourage the school to put more of an emphasis on healthy “approved” snacks! We are only a few weeks into our first stint at the Elementary School so I feel like I want to spend a little more time observing first though. Certainly if you have any ideas or experience or suggestions in regards to healthy foods in schools or healthy food PTA/PTO committees…please share! In the meantime, let’s talk about what I have been sending in my daughter’s lunchbox. I was at first giving her separate little items like a sandwich in foil, some pretzels in a small snack container, an apple in a plastic bag, and at the end of the day she was coming home with hardly any of her lunch missing! Then one day I went to school to have lunch with her. I got to witness first-hand the limited amount of time they have to actually eat in a cafeteria that naturally provides a massive amount of distraction. By the time she got the last little container open it was practically time to start packing everything back up. So I knew I had to do something different, and I’d heard about all of the lunchbox/bento box/laptop lunch systems out there. While I liked the idea, I decided that I certainly didn’t need anything fancy or expensive (or that required me to pay an additional 5 or 10 bucks in shipping). So rather than ordering some overpriced “lunch system” off the Internet I just drove my car down to Target and spent a few bucks on a divided plastic Ziploc container. My 5-year-old now has to only take one lid off of one container and voila, her entire lunch is displayed in front of her. She has started coming home with almost everything gone since we made this change…and I am of course thrilled about that! I am also occasionally sending warm items in her little thermos as well. I will do a follow up post soon on those ideas and other options for snack time, too. Please also feel free to leave a comment with your school lunch ideas and suggestions if you have any! Way to go, mom! Those lunches look awesome!! Thank you for this post! I’ve been struggling with my kindergartener’s lunch – he’s been coming home starving because he says he doesn’t have enough time to eat. I’m going to Target tomorrow! Great suggestions on food as well. Your blog has helped me a ton. I love it! I hope the Ziploc container works for you guys too…and thanks for the comment! I use these Ziploc containers too and think they are great! Ultimately I would love to start using a stainless steel one like Lunchbots, but in the meantime, Ziploc provides an inexpensive alternative. My children both are dairy free, gluten free so our food options are a bit more limited. I loved reading this to see some other alternatives to what I have been packing! One thing is for sure…this experience (the 100 days and nut-free school) has taught me how much work it is for moms whose children have food allergies! I haven’t made chicken nuggets in so long…I should try again soon (especially now that we can have ketchup again)! Great suggestions, thanks so much for sharing your ideas! My son is allergic to peanuts so I sympathize as to how hard it is to find items that are whole foods where you can’t include tree nuts. My mom suggested Sunflower seeds and that has become a huge hit! They’re great by themself, in a trailmix and also Sunflower butter in a sandwich. Hope that helps! Thanks for the tips! And I did actually try sunflower butter, but my daughter wasn’t too crazy about (and it has sugar in it too). She is not a huge PB&J kid anyway…it is mainly the nuts as a snack (and in the granola bars I make) when it is hardest for us to avoid. We do love seeds though like you mentioned and soon (I keep promising myself) to make some separate granola with extra seeds and no nuts so she can take it to school! Grace(7) has the same tupperware and we do feed her the same healthy options. I will make a whole wheat pasta salad for her with pieces of cheese and chopped veggies in it. 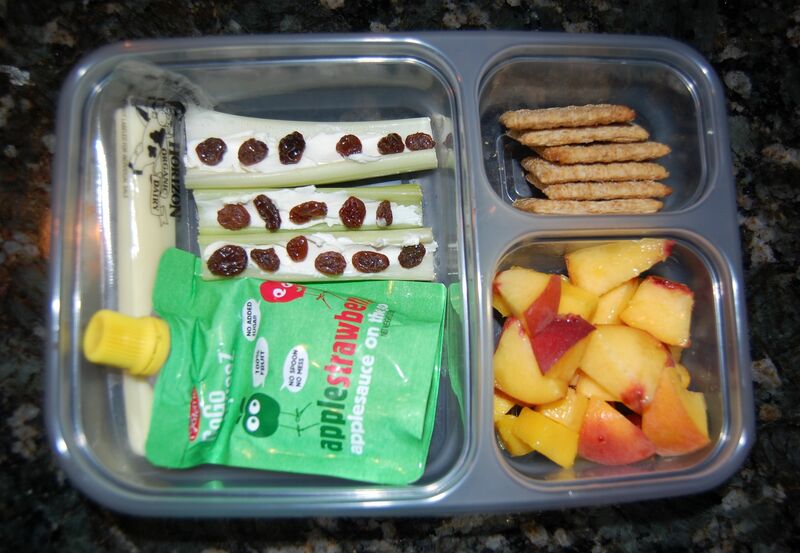 Yogurt sticks are easy too and the applesauce on the go is a hit with her too! The girls are really starting to embrace eating non processed foods with us thanks to you! Of course you already have one of those tupperwear containers you smartie teacher you! :) And cold pasta salad is a great idea…I will have to try that one soon! you must check it out. The site has almost a daily pic of what she sends to school with her son. Her recipes are endless. I have made several meals and snacks she blogs about…fantastic and rave reviews from at least 2 out of my 3 kids regularly! I’ve heard of this site before…I will definitely check it out. Thank you! As a lunch room supervisor at my children’s school I applaud you for working so hard to provide your child with such a wonderful meal. Were you able to sneak a peak at what some of the other children were eating while you were there? Gross eh? It only has 5 ingredients and they are all natural….no icing sugar!! There are recipes, and labels to include in the lunch so it isn’t mistaken for PB, on the website. We try out best to be locavores and while this product is a little beyond the range we like, it’s good enough to include. It’s made school lunches that much easier! You are the second person to recommend that soy butter to me so I will have to try it on her! Thanks so much for the comment. Thank You for this post!!! 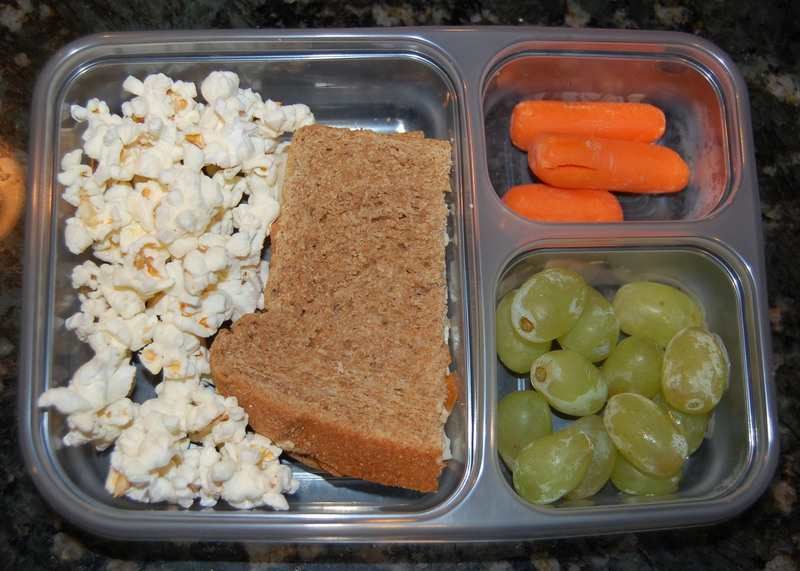 I have not taken the pludge with the 10 day challeneg – but these are real examples of lunches I can offer to my kids! I must say – I am aggrivated with you on the nut-free school. Our school is not nut free – but it makes you wonder – how many kids have nut allergies in the school? I’ve had mom groups before almost put stuff liek this into effect – and I asked, “Do we KNOW of anyone with an allergy? ?” Didn’t think so. Now I’m sure there must be some with the allergy at the school, but is that really necessary??? Thanks for the comment! And I know the allergy thing can be frustrating especially when we are not personally affected by it. I just have to think there must be an important enough reason for the school to go through this much effort to avoid all nut products. The one thing I do like about it though is that it proves schools can successfully avoid certain foods…and in my opinion next up should be sugar! Why not? Go straight to the principal! I had a problem with my kids spending too much money so I had lunch with them one day. Regular milk was in the same fridge as the upcharged drinks. The upcharged extra items were lined up just like all the included items. Nothing was labeled and no one was telling my first grader that his $2.50 lunch was costing close to $5.00/day! I bypassed everyone and went straight to the front office. The next day signs were up, labels on everything, and seperation of upcharged items. Too bad my kids had a homemade lunch in tow. That is encouraging that you had so much success with making a change in your school cafeteria! Thanks for the encouragement. Also, in regards to the smoothies. I tried freezing some too, but then I wasn’t sure how to send it in her lunchbox since it will melt back to a liquid form by lunchtime? What do you send it in? And the pizza is a great idea! I’m inspired by your site and although we haven’t taken the official “challenge” — we are well on our way to cleaning up our house. My 11 yr old is a finicky eater and my 13 yr old son was buying “junk”. 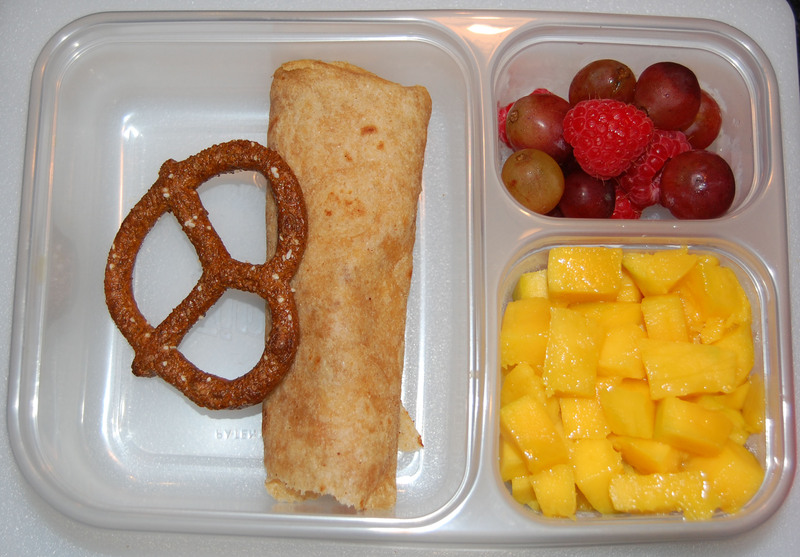 We have started packing lunch daily — I use this site and others to get ideas. Keep them coming!! Quick question for you — do you consider home baked sweets ok as a treat (ie., banana breads, cookies, etc.)? I use whole wheat flower, organic oats / sugar / apple sauce, etc. Thanks for the comment and good for you guys making some changes (even if it isn’t the official challenge it is fabulous to be making some positive changes!). When I make homemade breads/sweets I use whole-wheat flour and honey (which is still technically a sweetener), and I absolutely think it is okay to eat. The best part about making it at home is that you see how much sweetener is going in there and then depending on the amount that is in each item you can eat it in moderation. We tend to eat some and then freeze the rest to help us not eat too much at once. I understand your aggravation over a nut-free school, but please realize that the schools do this to protect children that have nut allergies–my son would be one of those children since he has a peanut allergy. Allergies to peanuts are severe and life-threatening. A child with a peanut allergy can DIE from simply touching a peanut–do you understand that? And if you had a child that could DIE from something like this, wouldn’t you want for him/her to go to a school that cared to protect them from dying? My son’s school is not nut-free, but I wish it was! I get so annoyed by parents that whine about not getting to send their kids to school with a pb&j sandwich just because “someone” is allergic to peanuts. For God’s sake, can’t you get a little more creative? Sorry these kids with deadly allergies cause you so much trouble. And just so you know, I saw the nurse’s office at my son’s school and she has something like 40 epi-pens for children with nut allergies. The school has about 700 kids total. So, I guess you could say that there actually ARE kids with allergies! They’re not just making things like this up to make your life difficult. It would be nice if people like you had a little more understanding and compassion for those of us trying to protect our kids. I love the Ziploc container idea as a makeshift bento box. Very cool! I will be buying some this weekend and using them for my 6 and 4 year old’s lunches next week :) Thanks! It is always good to hear the opposing argument! And yet another side of the peanut issue – a child who has oral texture and/or sensory issues and can not, will not eat certain foods. For SOME children, this means that the “precious” PB&J is the only food they maybe able to take to pack and eat. Should that child starve because of their condition? What will children do when they are adults, out in the real world, where PB is not banned? For the posted her talked about your experiences as an adult – do you propose that even adult work places, restaurants, etc should be peanut free? I’m not so cruel as to wish an allergy on any child, or a sensory condition, my family has both already. I think there can be compromise to the food allergy issue. But, if an allergy was truly a life or death issue (thinking of kids with the air born peanut allergy issue I’ve heard about), I know I would NOT send my young child into a public school, I would home school, plain and simple. Schools screw up too much, even with “rules”, why risk it? Otherwise, if the allergy is consumption based, there is no reason why even a 5 yr old can not learn to not eat someone else’s food. plain and simple – i had to teach my child to not touch ranch dressing (which has a whole lot less understanding then a nut allergy) by age 3 when she was in headstart with an IEP due to developmental issues, even she understood that. No one wants their “freedoms” trumped, and i wish people (whatever the dividing issue) would understand that. we all have to deal with the “cards” we are dealt in life, we shouldn’t try to trump and control others rather then learn how to live successfully with it. You can’t die form a sensory issue. You can however die from a peanut allergy. I am pretty appalled at some of these responses. these are innocent children and there are children who have died from this. A close friend of mine lost her 5 year old son to a reaction to peanuts. He did not share his food or anything like that. He took a sip from the water fountain where a child who had eaten peanut butter before him drank from. I am sorry you feel this situation is such an aggravation but it saves lives. I can’t even read anymore, my heart aches for this boy’s mother and little sister he left behind and to think there are people out there that think his precious life was not worth altering 5 meals a week. Also, this is a great lesson in compassion that you can teach your children moms. Others lives are important and their friends could get really sick or worse. Teaching your kids to put others needs before their own wants is a great lesson that will carry on for their whole lives. Also, there are so many alternatives to PB. We get soybutter from walmart of all places and it tastes exactly like peanut butter. Nobody would know the difference. Also to add…they did not know this little boy had a peanut allergy. He tried it before and did not like it so never ate it. With these allergies, it usually does not show up for the first exposure. somewhere along the way this allergy developed and unfortunately it was fatal for him could you imagine getting that phone call?? this little boy could be alive today if these rules were in place 7 years ago. What caused his death is that his throat closed up within seconds and by the time the paramedics got to him it was to late. Could you think for a moment how this family reacted to thins news? How his little sister who adored him had to hear her big brother was never coming home? How they had to call his dad who was on a business trip and tell him his 5 year old baby dies? His father had to fly home from Chicago knowing this. So, while it may be a PITA to you, I think it’s worth it. How would your child feel if this PB&J sandwich caused another child to go have a fatal reaction? You don’t think it’s real?? I promise you…it is VERY REAL. I have a child who, esp a couple years ago, flat our REFUSED to EAT at ALL unless it was PB&J or buttered pasta. REFUSED to eat. Should my child have to STARVE? For those that compared it to indoor smoking – you are nuts. That is like comparing apples to oranges. Not everyone reacts the same. Not every has the same severity. And unlike cigarette smoke, peanut butter (or even just peanuts) is not going to effect 100% of the population, but rather then very minor % who are allergic (which, I do understand, is growing). If my child were so sick that a simple PB&J sandwich would cause them to die by being simply NEAR IT – my child would be home schooled until it was no longer an issue (how many upper grade students do you see having PB&J on a daily basis?) and i mean it – 100%. If home schooling was 100% not an option, my child would no eat in the cafeteria, i would make sure the school could provide a nut free lunch space (not the nurse’s office either, were sickness can be rampant), and maybe even make sure a friend or 2 with a safe lunch could sit with him or her, with supervision of course. There is always alternatives. But to make an entire school of 200, 400, or even more students be completely nut free, no, and i would say that if that were my child that had an allergy, fatal or not (and my children do have allergies, so I’m not just “blowing smoke”). I am sorry your friend lost her son in such a manner. I wouldn’t wish it on anyone. Are those Easy Lunchboxes? Aren’t they the best! What does your daughter carry her’s in? I only have to send mine to the sitter but soon they will be toted to school as well and need to find a bag/container to store them in. oops…skipped over the part where you said theyare Ziploc=). This container fits in a soft lunchbox that we got at Old Navy at the beginning of the year. My neighbor also said it fits in her daughter’s that I think she said came from Pottery Barn (with a separate drink container on top). I think the boxes with the soft sides will have a better chance of fitting it. Good luck! very helpful post!! I can’t wait to try some of those ideas soon! Thank you! I didn’t see muesli in your recipe arsenal. My daughter is in Grade 1 and last year I taught her how to make nut free muesli so she could take it to school as a snack. We usually use plain yogurt (made with milk and bacterial culture only), fair trade ribbon coconut, rolled oats, sometimes rolled barley (which if you toast it a little first has a lovely nutty flavour) and whatever fresh or dried fruit she wants to add. You can also add a little local honey to mixture or hemp seed. You can mix a big bowl and keep it in the fridge all week. She actually took this as her lunch today. Today it had frozen saskatoons that we had picked this summer. Try pumpkin seed butter in her sandwich. My 3 yr old son really likes it and it is great mixed into your oatmeal. That is a great suggestion…my daughter loves oatmeal and the granola so I will have to look into nut-free museli recipes. Thanks! These are all lunches my daughter would eat! She is only in 1/2 day kindergarten, so I’ll start some of them at home. Hummus has ALWAYS been the “nectar of the Gods” at our house! I guess I should start making my own, but admit we LOVE Trader Joe’s brand! (Is that bad?) My son is another story, but I’m trying! On another note, what is your policy on vinegar, olives and pepperocinni peppers? I have the most delicious recipe for a marinated Italian veggie salad (which does have 1 tsp of sugar…maybe agave nectar could replace it?) that I would love to share. Maybe you have already done one? I’ve actually hear that TJ’s hummus has a pretty reasonable list of ingredients, but you should definitely try making it from scratch b/c it doesn’t get much fresher than that! Also, olives and vinegar are absolutely approved. I’ve never looked at a bottle of pepperocinni peppers, but I think it sounds pretty innocent. Definitely check the ingredients to be sure though. And I would suggest just leaving the sugar out all together (it’s only 1 tsp) and see what it tastes like before you add a substitute. I’m noticing a lot of starchy foods in the lunches. What about adding in hard-cooked egg? or some other protein leftover from dinner the night before? 2-3oz of something other than cheese (because that is more of a fat food than a protein food) would be good. As for the allergy thing … wow. never had to deal with this when I was a kid. My how life has shifted. I am curious as to WHY so many children have these nut allergies today. Is almond butter not allowed? Other ideas – roasted veggies with the hummus in stead of just raw, veggie frittata or quiche, sandwich wraps – using hummus of any variety, pesto, or marinara as the spread instead of typical mayo or mustard. I actually did a hard-boiled egg (and egg salad) last week! My daughter loves that stuff too. And my 5-year-old isn’t really the biggest fan of cheese (like the rest of us) so I do feel like I need to think of other alternatives for her lunches so thanks for the ideas! And the school does not allow any peanuts or treenuts…so no almond butter! I have no idea why things have changed so much since we were kids. It doesn’t seem right. I too work in a school and am horrified by what many parents send for their children to eat, calling it lunch. Equally tucked out by what the school calls lunch! 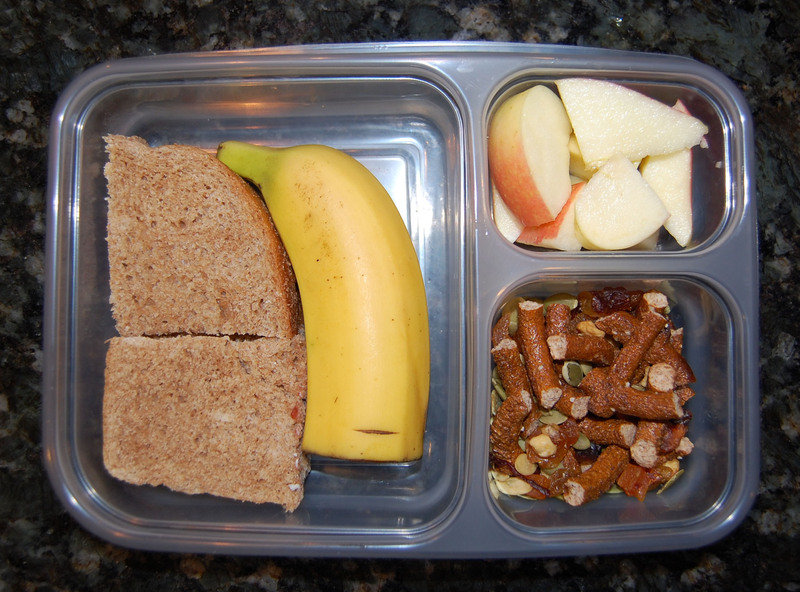 Good for you–I’m packing a kindergarten lunch daily and love all the suggestions. We use the ziploc container, too, but after several years in school (my eldest is now in 3rd grade), I’ve found the kids prefer a hot lunch. I pack leftover dinner in a Thermos every morning, giving them a whole-foods, nutritious hot lunch. I also pack another vegetable (my 1st grader wants raw carrots every day, the 3rd grader alternates depending on what we have available) and a fruit. Along with a stainless water bottle, cloth napkin, and real silverware when necessary. No waste lunch, nutritious, and gives them plenty of energy for the day. I use one of those thermoses too! I actually use it about half the time for things like oatmeal, leftovers, whole-wheat noodles, etc. I want to do another post soon including some of those hot lunch ideas so thanks so much for sharing your tips!! Also, I am totally on board with the reusable stuff in the lunchbox too. Within our first week of kindergarten I couldn’t help but notice the waste! We pack almost identical lunches. I as well have a Kindergartener and she has been called, in both pre-school and now K, the healthiest eater in the class. It makes such a big difference in her focus and energy through the day. I feel so good about my choices to think a little bit longer and harder, and to be a little creative about what I feed her. She is allowed school lunch 1 x a week (turkey sandwich or pizza days). I bet that made you one proud mom to hear what a healthy eater she is! :) Thanks for your comment! Thanks for sharing the perspective from someone with a child that has nut allergies! I’ve heard a lot about the other “butter” options, but my 5-year-old isn’t really a huge pb&j fan anyway so we just skip it. I’ve struggled more with not being able to send in yogurt/granola (since I make it with nuts) or trail mix type snacks. We are figuring out other options though and surviving just fine so far! I have a question as well that I forgot to add in my previous post. Where do you find whole wheat pretzels? I have stopped buying pretzels because I know they are a terrible snack with all the white flour in them, but if I could find whole wheat ones, my kids would love it! I have looked around, but haven’t seen any. Thanks! I wanted to add my comments about peanut allergies. As an adult with lifelong peanut and egg allergies, I know that even today, there are people around who simply dont “believe” in allergies. I have been rushed via ambulance to the hospital with paramedics desperately trying to get a breathing tube in due to people who were certain that if I didnt know what I was eating, their theory that I wasnt REALLY allergic would be proven. On two different occasions, I “coded” from anaphalactic reaction and came within a hair of dying. If I touch peanuts and touch an eye accidentally without washing my hands with soap and alcohol(peanut oil can be very difficult to remove), my eye will look like something out of a horror movie in five minutes or less. This can become a systemic reaction, so its Epi-pen and off to the doctor if that happens. (By the way, for the “doubters”, do you realize that an Epi-Pen is a shot of adrenalin? Its an emergency measure to enable someone to GET to the hospital without dying, they are still on their way to the ER. You dont use it and go back to class!) If someone has touched peanut butter and then touches my hand without washing theirs, same reaction. I am an adult, and know these dangers and recognize the need to be vigilant–and still, from time to time, somewhere there is a slip up and it happens. Can a five year old be as vigilant as I have to be? No, obviously that’s impossible. Can a teacher watch one five year old like a hawk and watch a whole lunchroom to be certain that no one laid a peanut butter sandwich down on a table and it didnt get wiped before an allergic childt touched it? Obviously not. THIS is why peanut free policies are needed. Thank you so much for sharing your perspective Sherry…it sounds like it can be VERY scary with such a serious allergy! Parents with highly allergic kids sure are lucky that some schools are banning peanuts just for their safety. At the same time it is unfortunate for the rest of the group that doesn’t have any allergies, but obviously more than worth it to save some lives. Most schools have a nut free table in the lunch room for those children. I don’t think the whole school should be nut free though. There are other things kids are allergic too that can cause the same reaction, wheat being one of them. Yet schools don’t ban wheat. To me, if you ban one particular food then you need to ban all of them that have an allergic reaction. Public school is a privileged, not a right….that’s why you can get expelled. We will have to home school our children to keep them safe from wheat until they are old enough to know the difference. Which at 3 and 4 they know to always ask. But other kids come and touch their food, or them after eating wheat or while holding a wheat cookie which makes them sick. A child with sensory issues is a valid point, but now we get into who has the greater right–the person who has issues that make them dislike textures or the person whose life is at stake from exposure? In such a situation, I would suggest that an IEP be written to allow peanut butter if, and only if, the child eating it can be taught and can demonstrate that they can follow a clean-up protocol that would eliminate the chance of peanut oils ending up somewhere that can cause danger to an allergic person. We’re talking about a life here, and in the real, grown up world BOTH children will have to cope with this, not just the allergic person. By the way, sorry to “hog” the comments, but I thought it was important to note that I am NOT considered to have a “serious” peanut allergy! The experiences I have described are very typical, I am fortunate enough to be able to walk in a place that has peanuts sitting around, although its not the smartest thing I could do. I am also able to sit on a plane next to someone who is eating them as long as they dont touch me before washing their hands, people with severe allergies can start reacting just from the proximity. Some great lunch ideas! Even though I have teens, I can still get some great ideas from this. Teen boys just need MORE. lol! I am very happy I don’t have to worry about being nut-free at their school, although I understand the need (being a celiac and not able to have casein either) the issues surrounding food allergies and diseases. Selfishly, since we already don’t do gluten or dairy, I’d hate to have to not do nuts too. Strange how this has become such an issue. Hi Lisa- I am Jacob’s mom and am sorry that I just know found out about your website. This is really neat and I am loving reading this. I wish I had of known about these food trays that you sent lunch in, what a great idea. Too bad school is almost out but at least there is always next year! I understand your frustration about the nut free policy. I know that it is deadly to some kids, but so are other things like wheat. I have two kids who get VERY ill when around wheat. They don’t have to eat it, just touch it. It would be easier on me if public places “outlawed” wheat, but that would not be fair to others. I think if the parents of the nut free kids are worried about it then they should home school. We plan on homeschooling our kids just for that reason. I know that may sound harsh to some parents who have a nut allergic child, I don’t mean it to be. But if we had to ban all foods that kids were allergic to there would be very few things left to eat. Betno boxes are amazing. We have a few laptop lunch boxes and several Japanese style bentos. We love them. An alternative to homeschool in many states is a charter virtual school. It’s considered public school, but the vast bulk of the work is done at home. Check out K12.com or Connections Academy. This is a great option for children with allergies or academic needs alike. And you don’t have to deal with the sending meals, worrying about snacks, etc, etc. we care for such information much. we were seeking this particular info for a long time. Thank you and good luck. 1)Perhaps your school can have a nut table. Kids can bring whatever nut products they want and sit at their own table so that their hands can be washed right after eating. This would avoid a death like mentioned above and provide the nutritional needs for those without nut allergies. 3)If your child has sensory issues consult a speech therapist or occupational therapist. I have been in this situation and a therapist can work with your child to expand their diet without forcing them to eat anything they aren’t comfortable eating. This makes every meal less stressful for your entire family. 4)If your child has very strong aversions to any foods it could be a food allergy or oral allergy syndrome which is a cross reaction to certain pollen allergies. 5) A child’s life is worth saving. A girl died in Chicago from accidentally eating nuts at a school party. Another girl in southern California died on her prom night from accidental nut ingestion. There’s a young woman in a coma since march from accidentally eating nuts at school and a boy in the UK with brain damage as a result of a substitute teacher giving him something with a hazelnut in it. These reactions happen all the time and are often reported as an asthma attack or heart attack as those often happen when someone with a food allergy eats something they are allergic too. Food allergy in children is now 1 in 13. Food allergies can develop at anytime. You may end up with a nut allergy as well as anyone else in your family. My youngest is allergic to wheat,peanuts, eggs and dairy. He cannot touch these foods without reaction. When he was placed in a room with a tree kid allergy kid all I could think was “now what do we eat!? !” But we manage…and it helps him understand other peoples’ needs are important too. My heart just sank as I read this. I send my 6 year old to school every day and I rely on other people to keep her safe. She has a severe peanut allergy. She is contact reactive. She is air particle reactive. We have experienced an anaphylactic reaction in which her blood pressure dropped out and her heart nearly stopped. I have sat in the backseat of my car as we rushed to the hospital and begged my toddler to breathe. I want her to go to school, to be a normal kid. She has a 504 plan that dictates her day so she can be safe. When I send her to school the only thing between her and death is her teacher, the other parents, the lunch staff etc… I rely on all of those people to keep her safe. Perhaps this could be an opportunity to teach your kids about looking out for others? About compassion? About realizing that sometimes we have to give something up because someone else’s need is greater. …and I hope that if any of you were ever to meet my daughter, that you wouldn’t see her as the “allergy kid that messes up our lunch planning”, but as a bright and beautiful girl that she is. Natalie, I know it has been a while since you wrote this and I hope you are all well. My kindergarten daughter doesn’t eat meat, so I was dismayed when her pre-school and then her primary school went nut-free. However, along with my dismay, I realized that we have it easy. For most people, eating nuts it is a matter of habit and convenience rather than health. Now, a year and a half in to nut-free lunches, my daughter has become a more more versatile eater and I use a little more creativity sometimes. I absolutely agree that it is a situation that teaches children (and hopefully adults!) compassion and empathy. She does have kids with nut allergies in her class and I would be horrified if we somehow caused a health problem for one of them. I just want you to know that not ALL parents of nut-eating kids resent those with allergies or harbour hostilities. I think there are quite a lot of us who are sympathetic. We are trying to eat healthier and after seeing the Prevention article mentioning this website, checked it out. I’m a little put off by the attitude towards the peanut allergy kids, however, as my son has a life threatening peanut allergy. Would they rather me send in fish crackers than some nuts you say? The answer is yes we would, as exposure to peanuts can result in immediate death to a child allergic to peanuts. Every year mothers of peanut allergic children have to try to keep their child safe while dealing with attitudes of people who think it is a burden they have to pack nut free. As these allergic children get older it becomes easier as they can read labels and stay away from certain foods. Please don’t try to combat this issue, but continue to come up with wonderful healthy alternatives. Got some great lunch ideas here and it is worth the inconvenience to provide a safe environment for all. I would avoid soy butter for your daughter. 90 percent of soy is GMO, and soy mimics estrogen, not a great thing to give young girls. one of the main reasons I cut out processed food (or am attempting to cut out processed food) is to avoid soy which is on virtually every label. Goggle “dangers of soy” and you will be amazed at what the FDA allows us to consume. How about a jam and butter sandwich? Lots of good fat, the perfect amount of sweet. It would be like dessert on that delicious bread you bake. It is great that schools are nut/peanut free. Poor you, my child could die from peanuts. You think you have it hard!!!! Remarkable issues here. I am very satisfied to look your article. Thanks a lot and I’m looking forward to contact you. Will you kindly drop me a e-mail? I bought the “bento boxes” from Amazon and I love them! However, what lunch boxes do you use to send them to school? The lunch boxes we have are narrow and tall as opposed to wide and short which is fine for dry foods but if I want to send yogurt – well, big mess! Suggestions appreciated. I am not sure, which boxes you bought, but I can tell you that the zip lock ones that we use fit in Lands End and Old Navy rectangular lunch boxes. I don’t have children yet, but I checked the lunch menu for the school they’ll be attending…It’s nothing. But. Junk. I’m not even a parent and I was upset. This is what parents allow their children to eat. And on another note, the amount of junk parents buy their families. Oh my God! I work in retail and every time someone buys $100 of food stamps on junk food, I have to bite my tongue and try not to lecture them. You should have to take some sort of nutrition class. Sorry. Pet peeve of mine and one my husband always hears about. Hello To Everyone! I think food allergy questions are sensitive issues. My children also attend a school that is peanut/nut-free,so I too must be creative when making lunches, and the same as some of you I dislike some of the snack suggestions that the school provided. But I would never want to put another child at risk so a rule that I started with my children is to not offer another child something from there lunch (food allergy children should be encouraged to question foods before putting into their mouths)as there are many severe allergies. I also believe that there should be other policies included in school lunch routines such a washing hands before & after eating and children should also wipe clean their eating area. I provide my children with a few hand wipes (for hands & eating spot). And getting back to lunch items that I give include lots of fruit, veggies, seeds (pumpkin or sunflower), cheese, applesauce, peanut/nut-free trail mix, chopped leftover meat or poultry, yogurt, and hard-boiled eggs. My son was once in a class where another child was deathly allergic to eggs so the teacher banned visable eggs (hard boiled or egg salad)for other children to bring. So the big issue is teaching our children basics of not giving away items, have children with food allergies question food, cleaning of hands & eating areas, and good adult supervision by teachers or lunch time supervisors (not older grade kids, I’ve seen this in past). Happy lunch planning everyone! We are fortunate not to have severe food allergies in our family, but I used to work at a daycare center where many of the children had allergies. Originally, when the center was small, we had a nut-free policy because of a child with an extremely serious allergy. Then, we got a new school nurse who decided calling the center “nut free” would give parents a false sense of security. I think she was right. The center had no control over what kids would eat before they came to school, whether or not they wiped peanut butter on their shirt, etc. What if a teacher went out to lunch and unknowingly came in contact with something that could trigger an allergy? What if a parent whose child was severely allergic to wheat, eggs, dairy, soy, or latex (we had all of those allergies in my class at one point!) wanted the center free of those things as well? Instead, we had a very clear plan for each child with special dietary needs. It was much more realistic and effective than an overall ban. Now, my kids are in school and there’s a nut free table in the cafeteria for lunch. One of my son’s has several nut allergies in his class and the teacher asked that kids don’t bring products with nuts for snack, but just in case they have a strict hand washing policy and take other steps because they know they can’t guarantee there won’t be anything peanut related in every child’s snack for the entire school year. I think is is much better than a false sense of security that comes with a “peanut free” sign on the door. It also protects the school from any liability. There’s no reason why a balance can’t be reached for everyone. Life is all about compromise and give and take and I think it’s great for kids to learn to think of others. I think your response is the most sensible I have seen about allergy free zones. No one can totally control an environment with hundreds of people bringing foods (and other allergens)that might be unsafe for someone else. Unfortunately, I think the burden should fall on those with the allergies versus complete restrictions on those who don’t have allergies. One teacher at my son’s elementary school had an allergy to citrus (including odors), so, the entire school was restricted from bringing anything citrus to school. Sorry, this just seems like PC insanity to me. If my children had deathly allergies, I would find an alternative that worked for them rather than asking everyone else to accommodate them. Where is your compassion for a little 5 year old boy that has to sit at a table by himself at lunchtime? He won’t eat his lunch at all or just one item? Hard for the little guy to understand. Count your blessings lady. Actually, the burden does fall on the parent/child with allergies. When you drop your child off at school, you only have the inconvenience of not being able to pack certain items in your child’s lunch. I, on the other hand have to spend my day in fear that my child will come in contact with another child who has eaten peanut butter and forgotten to wash his hands. I, the parent of the child with allergies, have the wonderful experience of having to meet the ambulance at the ER, wondering if my child is going to survive another careless exposure. No, it’s not fair that Johnny can’t bring trail mix to school. It’s also not fair that my child could die from eating a peanut. And yes, I have found an alternative that works for us. He no longer attends public school. I am a kid and have been looking for healthy foods like this to help me lose weight and these lunch foods sound delisous and healthy and something I would actually eat.